Werner's Cairns blog: The people in Victoria, Australia, are also fighting forced fluoridation. 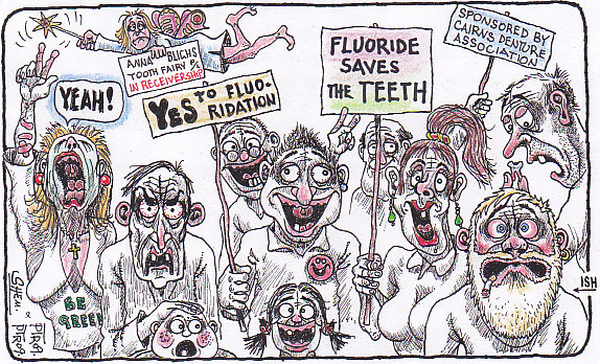 The people in Victoria, Australia, are also fighting forced fluoridation. I would like to draw your attention to four events in Australia which I believe demonstrate the corruption of science needed to propagate the discredited practice of water fluoridation in that country. Just join the dots. Here are some letters to THE EDITOR, published in a Ballarat newspaper early November 2009. On fluoride the few rule the many. It has bemused me how the few can rule the many. I have friends who fought the fluoride in Geelong more than 25 years and then they moved to Ballarat after the battle was won here. Can I ask you if you have a Committee for Ballarat and if it was 'headed up by Dr Stephen Vaughan, oncologist and former head of Barwon Water, Geelong? If so, I am not surprised about the push, for fluoridation as the Committee for themselves, Geelong were the ones who lobbied government here. Natural justice in the world would be a fine thing and we, as residents of this great nation having a democratic say in all things which affect us would be fair. Is your paper aware that the fluoride you will be having diluted in your water is slurry from smokestack chimneys? Will your fluoride come from your brickworks or from Incitec Pivot's Portland or Geelong industry? Unfortunately, many people will stop visiting your city if your businesses serve coffee, tea or anything which is cooked, grown or canned in fluoridated toxic water. If you export anything which has been near fluoridated water it would be best if you checked with your overseas customers as the EU has banned any produce which contains fluoride, 98 per cent of the world is not fluoridated. I suffer from chemical toxicity, I am affected. Other causes for dental decay rise. AS A visitor to Ballarat I am upset that I will have to resort to buying bottled water due to your town water supply being fluoridated. I have kidney problems and will be forced to avoid the poison hydroflurosilicic acid (fluoride). I greatly resent that my choice of a morning cuppa at a Ballarat coffee shop is now a no-no. Anyone who has researched the adverse effects of fluoridation will also be concerned. A Department of Education survey in Sydney showed that dental decay rates in children were declining prior to the introduction of fluoridation the reasons being improved dental hygiene and fluoridated toothpaste. In Sweden, fluoridation was declared illegal after 10 years' research found fluoride to be ineffective, inefficient and dangerous. When requested by the Swedish Government, WHO failed to provide evidence of their claim that fluoridation was totally safe. Reduced dental care/funding and the high cost of visiting a dentist are more likely to be the contributor to the waiting list in Ballarat. ON NOVEMBER 16, the people of Ballarat are to have fluoride in their water whether they want it or not. A small band of dictators, health services, Central Highland Water and Ballarat City Council agree that it will be better. So with no referendum, in it goes. It does not matter about the bad reports on its affects from other countries, Some who have had it and no longer will allow it due to its bad effects. I won’t drink it because I have false teeth and have a tank. A lot might not be in that position and they will not be able to buy tablets even if they object to it. This is because no referendum was held to properly gauge the residents of Ballarat's views. Also' what happened to the union who opposed it before and had it stopped? Have they been swayed to change their mind now? What a pity. WHENEVER our government is questioned about the sense behind fluoridation, the reply is, they are committed to improving the oral health of Victorians. So why haven't they introduced a well-funded public dental service that educates people in dental hygiene and appropriate diet - one that treats problems early. This would also address other major health problems, such as obesity. Or maybe they could put diet pills in our water too! Mass medicating, forcing people to drink a chemical for the greater good, is wrong on so many levels. If people want to use fluoride, let them use it. Everyone has the right to choose what goes into (and on) their bodies. If I'm in the habit of drinking two litres of water a day in an aim to stay healthy what will my daily dose of fluoride be? But if I’m In the 'habit of drinking soft drink and sweetened fruit juices, how is a chemical in the water going to solve my dental problems? Teeth of people drinking sugary drinks are in need of more care, but they probably rarely drink water. They need educating, not a bath in chemicals. The fact that both American and European cities are now stopping fluoridation has to sound alarm bells. Why do we always follow their mistakes instead of learning from them? If there is one ounce of doubt about the side-effects of fluoridation, then it simply should not be used. You have to wonder who benefits the most by putting fluoride into our water. Look at parents for dental problems. 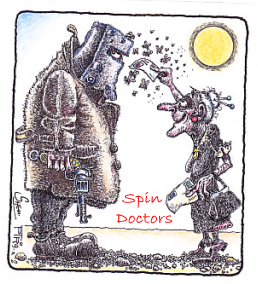 IN THE letter by Andrew R. Row the CEO of Ballarat Health Services (BHS welcomes fluoridation, November 7.) He lists a few figures stating that 90% of children under four admitted to hospital are there for dental related conditions. Has BHS taken into account the amount of parents who have given their children cordial, juice and soft drink in bottles since they were babies? With most arguing that their little darlings refuse to drink plain water or milk. I would ask Mr. Rowe if fluoridated water will be of any benefit with sweetened additives. And as for visiting the dentist I took my four your old and two year old to my dentist recently and paid a whopping $80.00 for them to have a quick ride in the chair and a check-up that lasted les then than ten minutes for both. If BHS wants to see less dental problems in young children, perhaps they should push for dental care to be provided alongside maternal health nurses in those early years to prevent any problems by weeding out the parents who have decided to make life a bit sweeter. Why should we have fluoride forced upon us when some parents look after our children’s teeth because it's the most economical thing to do? WORLDWIDE scientific studies (23) have found statistically significant declines in IQ in children exposed to elevated levels of fluoride. There has been found to be a consistent and strong association between exposure to fluoride and decreased human intelligence. Children living in water fluoridated areas have five times higher odds of developing low IQ than those who live in non-fluoridated areas. harmful influence on children's IQ as it disrupts intellectual development. The International Association for Dental Research, Toronto, Canada, among others are not "dodgy" as some would have us believe. Is it any wonder that referendums for fluoridated water have failed three out, of five times, and, in some areas, four out of five times? Optimal brain function for individuals and society is a public health priority. Further evidence on fluoridation is absolutely necessary before we poison our water supplies.